On 21 June 2013, a regular session of the Supreme Church Council of the Russian Orthodox Church began in the Cathedral of Christ the Saviour under the chairmanship of His Holiness Patriarch Kirill of Moscow and All Russia. In his introductory speech His Holiness presented the agenda and shared his thoughts about the development of theological education in the Russian Orthodox Church. 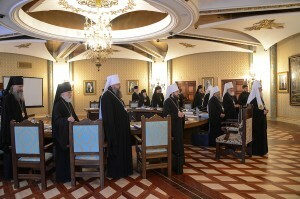 Metropolitan Merkury of Rostov and Novocherkassk, chairman of the Department of Religious Education and Catechization of the Russian Orthodox Church, delivered a report on the documents of the working group which coordinates the opening of educational centers training experts in the catechetical, missionary, youth and social work. Bishop Panteleimon of Smolensk and Vyazma, chairman of the Synodal Department for Church Charity and Social Ministry, presented a draft document on the basic working principles of the orphanages of the Russian Orthodox Church. Archbishop Yevgeniy of Vereya, chairman of the Education Committee at the Holy Synod, reported on the situation with education in the context of the ongoing reform. The participants discussed the implementation of decisions of the Supreme Church Council and other matters.